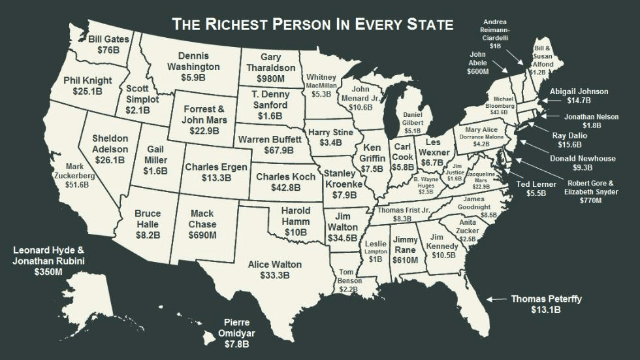 Here's the richest person in every state so you always know who to shake your fist at. America's a giant, rich place, but only one person can be the richest (Bill Gates - $76B); a more interesting question is "who is the richest person who can be (loosely) called my neighbor"? Well, if you live in Washington State, you're still competing with Bill "Almost Twelve Digits" Gates, but otherwise you may not even know who your wealthiest neighbor is. As they do every year, Forbes answered that question with their official list of the richest resident of every state. Forbes has an extensive report on this topic, with biographies for each person, but here's a quick overview. Washington State: Bill Gates, Microsoft - $76 billion. Nebraska: Warren Buffett, Berkshire Hathaway - $67.9 billion. California: Mark Zuckerberg, Facebook - $51.6 billion. New York: Michael Bloomberg, Bloomberg LP - $43.6 billion. Kansas: Charles Koch, inherited/Koch Industries - $42.8 billion. Although the top four people on this list made their money themselves (and the Koch brothers did actually run and grow the company started by their father), the next two are heirs to the biggest fortune of all, the Waltons of Walmart. They're followed not far behind by the Mars family, heir to the candy fortune. Arkansas: Jim Walton, inherited - $34.5 billion. Texas: Alice Walton, inherited - $33.3 billion. Nevada: Sheldon Adelson, casinos - $26.1 billion. Oregon: Phil Knight, Nike - $25.1 billion. (Tie) Virginia: Jacqueline Mars, inherited - $22.9 billion. (Tie) Wyoming: (siblings) John Mars and Forrest Mars, Jr, inherited - $22.9 billion each. One​ thing that's remarkable about this list is range at the top of the pyramid. Sure, big states like New York and California (and Wyoming for tax reasons) have also-ran billionaires who are richer than other states' richest people, but six states (gasp) don't even have billionaires! Connecticut: Ray Dalio, Bridgewater hedge fund - $15.6 billion. Massachusetts: Abigail Johnson, inherited/Fidelity Investments - $14.7 billion. Colorado: Charles Ergan, satellite TV - $13.3 billion. Wisconsin: John Menard, Jr., Menards hardware chain - $10.6 billion. Georgia: Jim Kennedy, inherited/Cox media - $10.5 billion. Oklahoma: Harold Hamm (& heirs), oil and natural gas - $10 billion. New Jersey: Donald Newhouse, inherited/Advance Publications media - $9.6 billion. North Carolina: James Goodnight, SAS business analytics software - $8.5 billion. One bizarre effect of the spread of the size of fortunes at the tip-top is that extremely wealthy people still feel inadequate all the time. Take #20, James Goodnight. As a self-made man, I'm sure he's OK with me using him as an example. He's worth $8.5 billion, which is approximately $8.5 billion more than you. But the gap between him and, say, the Mars heirs ($22.9B) is $14.4 billion. The gap between that guy and each of the Mars kids is almost double the gap between him and any old schmuck on the street. Tennessee: Thomas Frist, Jr., health care industry - $8.3 billion. Arizona: Bruce Halle, Discount Tire Company - $8.2 billion. Missouri: Stanley Kroenke, real estate, sports teams - $7.9 billion. Hawaii: Pierre Omidyar, eBay - $7.8 billion. Illinois: Ken Griffin, Citadel hedge fund - $7.5 billion. Ohio: Les Wexner (& heirs), Victoria's Secret, other retail - $6.7 billion. Montana: Dennis Washington, construction & mining - $5.9 billion. Indiana: Carl Cook, Cook Group medical devices - $5.8 billion. Maryland: Ted Lerner, real estate - $5.5 billion. Minnesota: Whitney MacMillan, inherited/Cargill industries - $5.3 billion. Michigan: Dan Gilbert, Quicken - $5.1 billion. Pennsylvania: Mary Alice Dorrance Malone, inherited (Campbell's Soup) - $4.2 billion. Politicians like to rail against the estate tax on behalf of their biggest donors, but it's worth pointing out that the hated "death tax" is why this list isn't just 50 Rockefellers, Carnegies, Astors, Vanderbilts, and other names of bygone eras. Most of these fortunes are self-made, and the Walton and Mars heirs are still first-generation. The estate tax is there pretty much to avoid aristocracy. Iowa: Harry Stine, agricultural genetic engineer - $3.4 billion. (tie) Kentucky: B. Wayne Hughes, Public Storage - $2.5 billion. (tie) South Carolina: Anita Zucker, inherited/InterTech Group - $2.5 billion. Louisiana: Tom Benson (& heirs), car dealer/Saints owner - $2.2 billion. Idaho: Scott Simplot, inherited/agriculture - $2.1 billion. Rhode Island: Jonathan Nelson, Providence Equity Partners - $1.8 billion. (tie) South Dakota: T. Denny Sanford, banking/credit cards - $1.6 billion. (tie) Utah: Gail Miller, car dealerships/Utah Jazz - $1.6 billion. (tie) West Virginia: Jim Justice, coal - $1.6 billion. Maine: (siblings) Bill Alford and Susan Alford, inherited (Dexter Shoe Company) - $1.2 billion each. As we reach the lowly, pathetic $1 billion mark, let's look at the gap again. The Alford kids may be worth $1.2 billion a pop, but #20 James Godnight is seven times wealthier, and the Mars kids are 20 times as rich. (tie) Mississippi: Leslie Lampton, petroleum refining - $1 billion. (tie) New Hampshire: Andrea Reimann-Ciardelli, inherited - $1 billion. North Dakota: Gary Tharaldson, hotels - $950 million. Delaware: (siblings) Robert Gore and Elizabeth Snyder - inherited/Robert invented Gore-Tex - $770 million. New Mexico: Mack C. Chase, oil - $690 million. Alabama: Jimmy Rane, lumber - $610 million. Vermont: John Abele, Boston Scientific medical devices - $600 million. Alaska: Jonathan Rubini, Leonard Hyde (& heirs), co-founders of JL Properties real estate - $350 million. Yes, you did the math right. 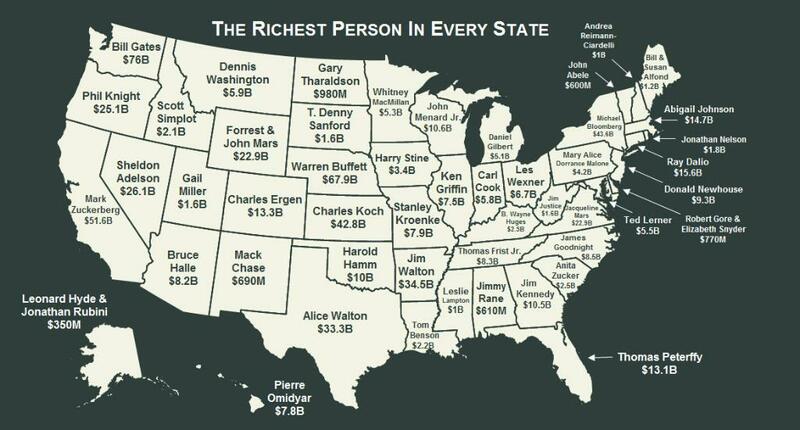 The two richest men in Alaska are 200 times poorer than their neighbor Bill to the south. If you like reading about the actual lifestyles of the rich and famous (for being rich), head over to for their interactive map and in-depth biographies of all of these success (and inheritance) stories.